Fair Use guidelines state you can only use up to 30 seconds of a song before copyright infringement occurs. How can you digitally take a full-length song and extract a portion for your project? How can students insert music clips into their PowerPoint slides while respecting the rights of the artists? This lesson shows you how! 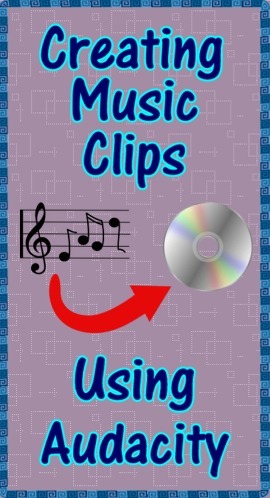 The 3 day lesson has students downloading TV theme songs, using Audacity (free) to create 30 second clips, and creating a "Name That Tune" PowerPoint. Very, very cool lesson! More please! Audacity can be overwhelming, but this looks like fun! Do the glazed looks on your students’ faces tell you it’s time to upgrade those tired PowerPoint presentations? Do you know how to make your slides talk? Do you know how to digitally record your voice & save your messages as sound files? With free software? This lesson shows you how! 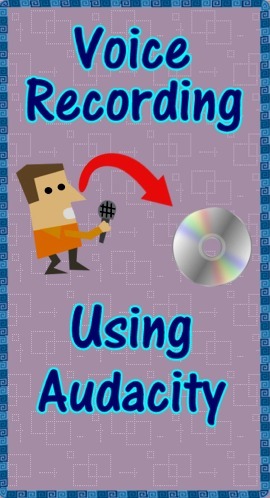 Learn how to download & install the free recording software Audacity, record your voice, make corrections, save your work as MP3 files, and import these messages into PowerPoint slides to make them talk. We librarians are often the "techies" in the building. I have recorded in Smart Notebook and in Powerpoint, but not yet in Audacity. Like the idea of adding sound effects! Looks great - can't wait to use it!